The Office of Financial Aid makes every effort to help you and your family secure the funding you need to become a part of our Central Piedmont family. To be considered for the most aid, we strongly encourage our students and parents to complete the FAFSA and all requirements by April 1 of each year. We have started processing financial aid for the 2019-20 academic year. Check your Financial Aid Self-Service. If you need additional documentation, bring in your documentation now. The earlier you submit your documentation, the earlier you can be awarded. Interested in Financial Aid? The 2019-2020 FAFSA is Now Available! The 2019-20 FAFSA® now available! Interested in financial aid for Fall 2019 through Summer 2020? Complete the 2019-20 FAFSA® as soon as possible to ensure maximum opportunity to access the best financial aid. Need assistance completing your FAFSA application? We’re here to help! Come to FAFSA on Fridays, from 9 a.m. to noon, or see a Financial Aid representative for assistance. Bring your parent(s) and tax transcripts and sit down with a Financial Aid staff member to discuss your questions and complete your application. For the 2018-19 year, the tax filing year in question and income information should be from 2016. For the 2019-20 year, the tax filing year in question and income information should be from 2017. Do not hesitate to call us at 704.330.6942 with any questions you may have. The national electronic financial aid application process is being impacted by the partial shutdown of the federal government. We’re making every effort we can to determine student eligibility. As a courtesy for students selected for verification (the process used to confirm that the data reported on your financial aid application is accurate) we’ll extend the time you’re given to submit the required documents. If you have questions, call the CPCC Financial Aid / Veterans Affairs office at 704.330.6942. We look forward to a great spring semester, and we encourage all students to continue to register. Please remember, all financial aid awards are subject to verification for accuracy. Adjustments may be needed after documents are submitted. You Can Now use $100* of Financial Aid for Bookstore Clothing and Food! When it becomes available, if you wish to get the electronic copy of the 2018 Form 1098-T TUITION STATEMENT instead of receiving the form by mail, please go to http://mycollege.cpcc.edu, sign on with your student ID, choose the “Student Menu,” click on “Financial Information” and select the “1098 Electronic Consent” link. The IRS strongly encourages the students to receive the 1098-T Tuition Statements electronically. The college will mail Form 1098-T no later than Jan. 31 to students who do not consent to receive Form 1098-T electronically. Per state, federal, and Internal Revenue Service (IRS) guidelines, beginning the 2014 year Central Piedmont Community College (CPCC) requested that all students provide their Social Security Number (SSN) or Individual Taxpayer Identification Number (ITIN) for reporting purposes. For additional information regarding 1098-T information visit cpcc.edu/cashiering/1098-t-tuition-statements. Financial Aid Students: Refund Info is in the Mail! Refunds for eligible students are processed electronically at CPCC! If you’re a new curriculum student registered for fall 2018 who receives financial aid, you will be receiving a bright green envelope from BankMobile in the mail soon. Please do not throw away this envelope! Inside your envelope will be an Instant Personal Code with instructions on choosing how you would like your financial aid refund delivered to you. The Instant Personal Code is required for you to choose your refund delivery option. If you choose to electronically deposit funds to a BankMobile Vibe account, a CPCC BankMobile Debit Card will be mailed to you. Remember this is NOT a credit card but a refund-only card. If you haven’t received your green envelope by Sept. 1, there may be an issue with your mailing address. Therefore, please confirm CPCC has your updated address on file by accessing it through MyCollege. If you see your address is incorrect in MyCollege, please update it. Then, please call the CPCC Cashiering Office at 704.330.4472 to request an Instant Personal Code be sent to you. Don’t worry, there’s no charge for lost cards. Simply call BankMobile for a replacement at 1.866.782.0821. Please contact BankMobile at 1.866.782.0821 or the CPCC Cashiering office at 704.330.4472. Don’t forget to file a FAFSA for the 2018-2019 year. Please complete your FAFSA online at www.fafsa.ed.gov; CPCC’s school code is 002915. Once you complete it, please allow 3-5 business days for processing. The CPCC Financial Aid Office will email you if you need to turn in any additional documents. Completing your FAFSA now will allow you time to resolve any issues and be awarded before you leave for the semester. If you need help, stop by one of our office locations today to complete your 2018-2019 FAFSA. Learn About CPCC’s Scholarship Opportunities! CPCC has three exciting scholarship applications available for 2018/2019. Please visit http://www.cpcc.edu/financial_aid/assistance/scholarships to apply. Students must be full time and graduating in 2019. 2. Letter of recommendation from professor, teacher or advisor. 3. Transcript demonstrating GPA of 3.0 or higher on a 4.0 scale. leadership roles have helped you grow individually and your future career goals. 5. A list of clubs, activities, accomplishments, leadership roles held and years involved, including those related to your field of study or military job experience. * Have a clear sense of what they want to achieve through education and a plan for doing it. * Have successfully completed some post-high school studies with a grade-point average of 2.5 whether they are currently enrolled or not. * Have shown through their studies, and in other ways, that they are serious about their personal and career goals. * Are the major source of financial support for themselves and/or their children, or need retraining in order to achieve higher earnings or greater financial security. A qualified candidate for a WINGS Bridge scholarship. Has a clear sense of what she wants to achieve through education and has a plan for doing so. Has successfully completed some post-high school studies and achieved at least the level of sophomore with a grade-point average of 3.0, whether currently enrolled or not. Is pursuing her first bachelor’s degree directly related to her chosen career plan. Has shown not only in her studies but in other ways that she is serious about her personal and career goals. Is a U.S. citizen or has permanent resident status. Is at least 25 years old. Meets eligibility criteria to receive financial aid. Is the major source of financial support for herself and/or her children, or needs retraining in order to achieve higher earnings or greater financial security. Is graduating from (or graduated in the last 6 months from) Central Piedmont Community College. Wants to continue her studies at Johnson C. Smith University, Queens University of Charlotte, or the University of North Carolina at Charlotte. Is eager to work with a mentor during the course of a WINGS scholarship, and to talk openly with her about successes, problems and plans. Active participation in the mentoring part of the scholarship is a condition of scholarship renewal. The CPCC Office of Financial Aid/Veteran Affairs is recognizing Financial Aid Awareness Week October 23-27 at all of their campus locations. Please stop by any CPCC Financial Aid Office for information on financial aid, scholarships, work-study and financial literacy. In order to fill out and submit the Free Application for Federal Student Aid (FAFSA®), you now need a FSA ID, made up of a username and password that you create. Although the FAFSA is considered your application, one of your parents will have to provide some information on the FAFSA and sign it, if you are considered a dependent student. Any parent, who wants to electronically sign the FAFSA, will need his or her own FSA ID. To avoid problems with your financial aid down the road, you (and your parent, if that applies) should create your own FSA ID. Do not let anyone create it for you. Complete Your FAFSA Now for the Upcoming Academic Year! On October 1, 2017, students can begin completing the FAFSA for the 2018-2019 academic year! Do not wait, go online today and complete your 2018-2019 FAFSA. When completing the 2018-2019 FAFSA, you will need your 2016 Federal Tax Returns. 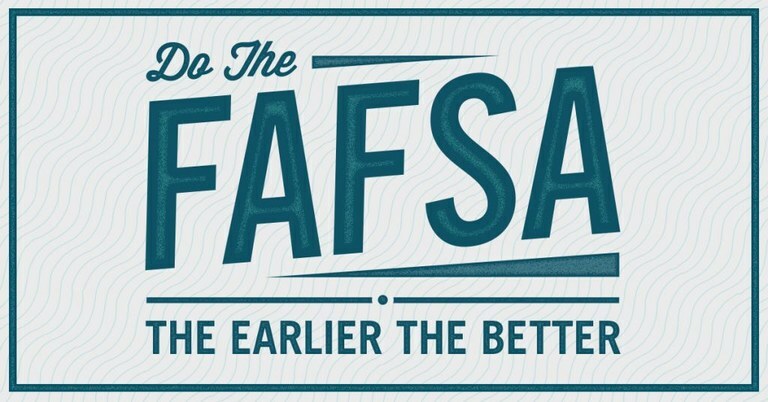 Why should you complete your FAFSA early? -By completing your FAFSA early, this increases the chances that the student will be able to receive the best possible award package. -This also provides the student more time to turn in documentation to the school, if additional documents are needed. If you need assistance with your FAFSA, please stop by any of your Financial Aid Office locations and someone will be able to assist you. The Department of Education (ED) shared that the IRS Data Retrieval Tool (DRT) will be out of service for several months, advising that “students and families should plan for the tool to be offline until the start of the next FAFSA season,” which starts in October. The tool, which was disabled in early March, was taken down by the IRS due to security concerns. According to ED, the IRS is “working to identify the number of taxpayers affected by questionable use of the Data Retrieval Tool.” While the DRT remains unavailable, students and families can continue to file the 2017-18 FAFSA using information from previously filed 2015 tax returns. The National Association of Student Financial Aid Administrators (NASFAA) released a statement yesterday afternoon urging ED to take immediate steps to mitigate the negative effects for students. Eligible financial aid recipients can purchase approved books, supplies and bus passes. Can only be purchased at Central Campus using financial aid funds. There is a $300 limit per semester on the purchase of bus passes. The cost of a 10 Ride Local Pass (limited to 10 rides only) or a Weekly Pass (Unlimited rides within that purchased week) is $17.60. The cost of a monthly Pass (Unlimited rides within that purchased month) is $70.40. Backpacks can be purchased using financial aid funds (up to $50 including tax). If your textbook is not available or is out of stock, pre-order and pay for it using financial aid. New! Flash drives can be purchased using financial aid funds (up to $45 including tax). · Check your Satisfactory Academic Progress (SAP) status to ensure you are in a financial aid eligible (SAP) status after fall 2015 grades are posted. Check your Financial Aid SAP status in your “MyCollege” account.